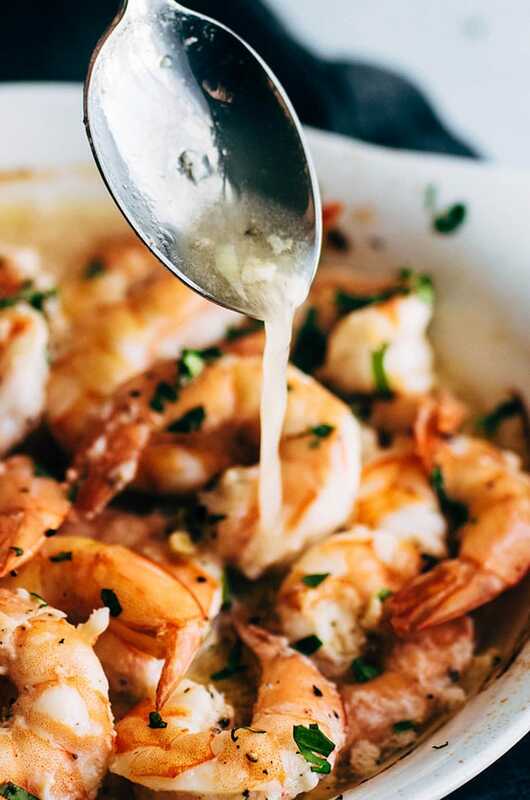 This simple white wine garlic baked shrimp is perfect for weeknight meals! Tasty shrimp or prawns in an easy white wine sauce and great over pasta, toast, rice, or vegetables! Step 1: Throw a bunch of stuff in a baking dish. Step 2: Bake the stuff in the baking dish. (Also, there’s wine. You know how we do). I’ve been reaching for shrimp a lot more than usual lately, because things have been BUSY. I’ve brought on new staff members this year (hiiiiiii, LAAS team! I heart you times a million), added some big projects to the calendar (side note: next week I get to tell you about something we’ve been working on since JANUARY), and am currently about to leave for something called a “vacation” (I hear they’re big). Sufficient to say, cooking (at least, the kind of cooking that isn’t work-cooking) is NOT something I’ve been doing a lot of. So when I need a work break and the hunger hits, I pull some Wild American Shrimp out of the freezer. And seven times out of ten, I turn it into this white wine garlic baked shrimp. (The other three times, I turn it into these hoisin lettuce wraps or this zoodle alfredo situation or some tomato basil loveliness because YUM. But mostly, yes, the one with the wine). Side note: I almost always buy frozen shrimp instead of fresh. One, it lasts longer that way so we cut down on food waste, and two, frozen seafood typically takes fewer resources to transport and store. Just pop them in a bowl with some cold water and swish it all around – they’ll defrost in just a minute or two. Then devein, peel, and you’re off to the races! And, okay, I knooooow that some people are all aboard the “fresh is better than frozen” bandwagon, but when it comes to seafood, what really matters is how it was grown or harvested – NOT what form it’s sold in at the store. Also, fun fact: If you’re not sure where to find Wild American Shrimp by you, check out the American Shrimp Processors Association’s handy dandy shrimp finder chart! It’ll give you an idea of what supermarkets in your area carry wild, sustainably-harvested shrimp, and they also have a list of online retailers to help you source sustainable seafood even if you don’t have great grocery options close by. There are a whole bunch of companies that source and shrimp sustainable seafood – not just shrimp! – all over the country, and I HIGHLY recommend checking one of those services out if you get a chance. But for real. 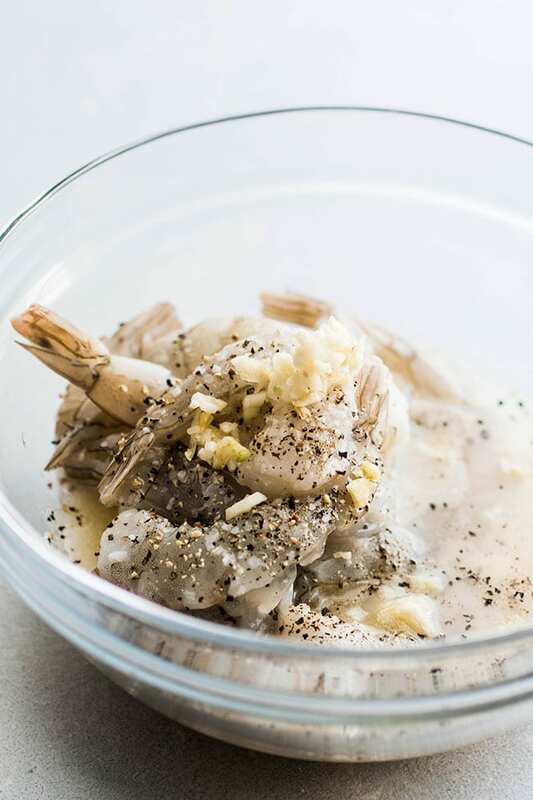 This shrimp recipe? It’s a winner. Bonus points if you serve it with some Easy Crusty French Bread! (Which, okay, you NEEEEEEED to try this baked shrimp with some Easy Crusty French Bread). An easy garlic baked shrimp recipe perfect for busy weeknights! 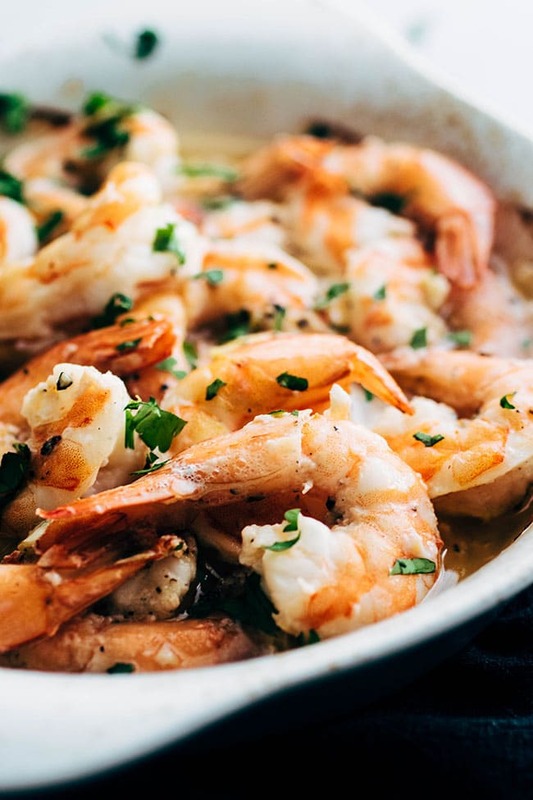 In a medium-sized mixing bowl, toss together shrimp, garlic, white wine, melted butter, lemon juice, salt, and pepper. Give it a good toss to make sure the shrimp is evenly coated. 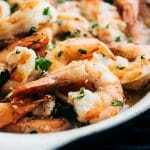 Pour shrimp and sauce into an oven-safe baking dish and spread shrimp out in a single layer. Bake shrimp at 400 degrees F for 12-18 minutes until shrimp is pink and cooked through. Top with chopped parsley (optional) and serve immediately. This is great as is, over rice or pasta, or served with a side of Easy Crusty French Bread to sop up all that tasty white wine sauce. This is a great blank-canvas recipe! Add red pepper flakes or extra herbs to the shrimp bake, or make it a sheet pan meal by adding some fresh veggies like broccoli, bell peppers, or whatever else you have on hand. 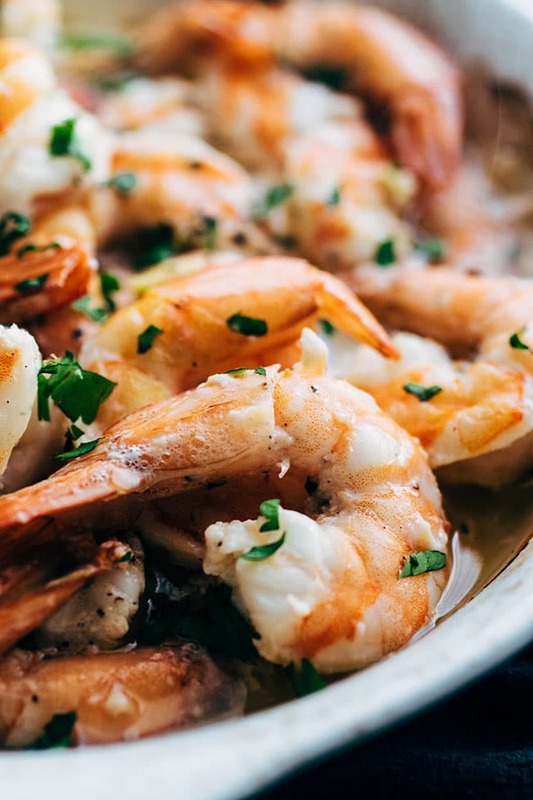 This garlic baked shrimp is also great when made on the stovetop – mix everything together as instructed, and throw it into a hot skillet to cook the shrimp (instead of baking it). Use lime juice and cilantro in place of the lemon and parsley for a fun twist. Don’t be stingy with your seasonings here! If you don’t want to season with salt, add some extra lemon juice to the shrimp to help the flavors come through. Thanks to my friends at Wild American Shrimp for sponsoring this post! 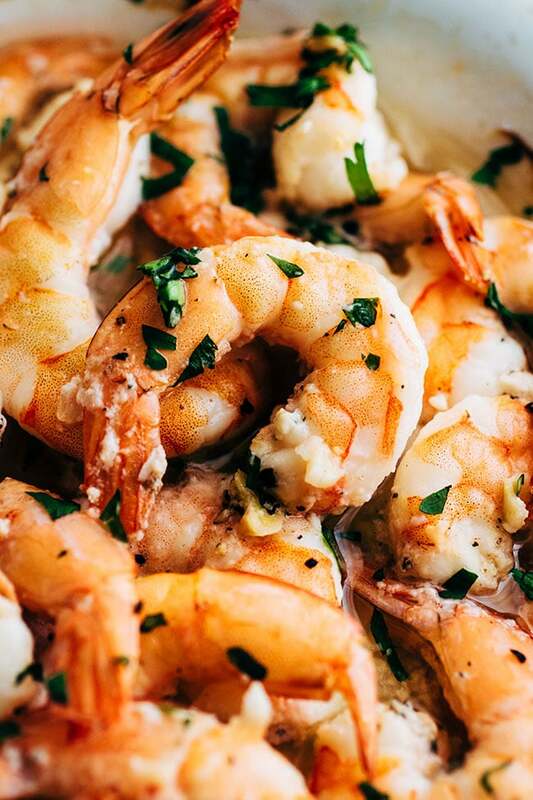 To find sustainably-harvested Wild American Shrimp near you, or to order frozen sustainable shrimp online, visit their store locator. I used ingredients, added old bay and red pepper flakes for some kick. did it stove top, turned out great! I made this and it was easy and delicious! Making it again for friends tomorrow night. I tried this but with red wine and onions and it came out great, Thanks! Thanks, Beth! I hope you loved it!